That seems to be the given when the elements comes together and, on this day in Raleigh's Umstead State Park, bordered by I-540 and highway 70 near Durham, that's what I got. It always amazes me how much enjoyment can come from finding something as simple a dead branch on the ground and being able to wave it around. 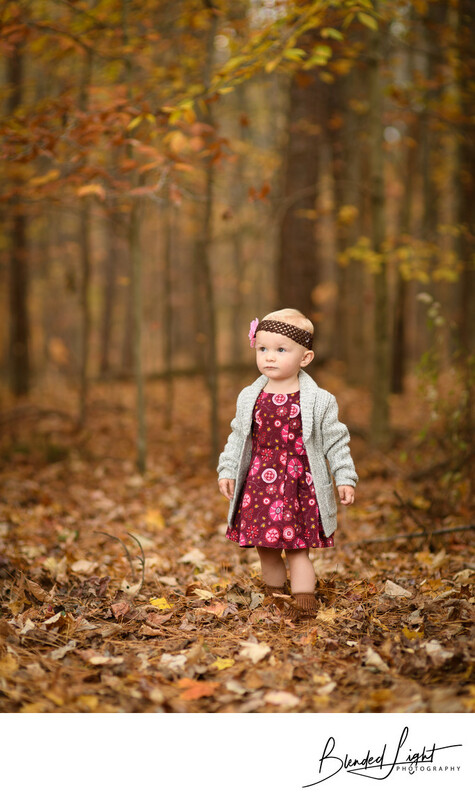 Add in a cute outfit, or a superhero one, some brightly colored leaves, and the watchful eyes of mom and dad and you should be prepared for a kid to be a kid. This shot is of Olive looking for her stick. We had tried to sneak mom and dad off for a couple picture really quick but Olive was having none of that. In fact, she melted down. But that's OK because we quickly reunited her with mom and dad and all was good. Since she was standing right where mom and dad had been for their picture and the flash was still set up from the image, we decided to give her a couple seconds and see what happened. Olive took her time, looked around, assessed the situation and then, almost as if on cue, turned for a quick glance to her parents to get their blessing. She received it and only seconds later, I'm pleased to say, she had found herself a couple sticks and was waving them around as only a kid can. What makes this image really standout is the contrast in rich color between her dress and fall colors. Her red dress compliments the oranges in the background, yet also appears brighter and more vivid, making to standout against the lighter background. And the look on her face to mom and dad is all child. Moments like this, you just let them do what they are going to do naturally. And that's a perfect way to look at doing images of children! Location: 8801 Glenwood Ave, Raleigh, NC 27617. 1/200; f/2.0; ISO 200; 85.0 mm.